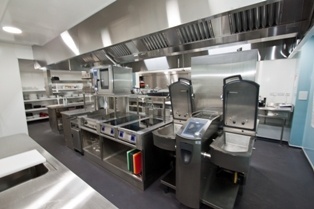 Valentine Equipment and sister company Cuisinequip were recently recommended by CCE to provide and install a mix of cooking equipment including induction hobs and fryers for the Les Rocquettes Hotel, part of the Guernsey-based Sarnia Hotels Group. Calum Le Noury, general manager for the Sarnia Hotels Group, talks about why they chose induction and worked with Valentine and Cuisinequip, “We first used induction equipment in the main kitchen of Moore’s Hotel four years ago. The equipment was okay, but the technology has moved on since then and I saw the potential benefits of continuing to use induction in its latest up-to-date form. It was natural then when we were planning to refit the kitchen at Les Rocquettes Hotel this year that I decided to take it to the next level. Les Rocquettes Hotel, head chef, Said Acharki, adds, “My team and I love working in the new kitchen. The speed of the 5kW induction hobs from Cuisinequip is incredible and I never would have believed what a difference they could make to our working practices and production speed. The working environment is now safer and so much cooler than it used to be.